The Fremont Community Theatre had its genesis in 1956 through a series of circumstances that brought together Robert and Carrie Stageger and Sally Ruland. Led by Bob Staeger, having completed his B.A. degree at B.G.S.U. in dramatics, they made plans to form a private theatre group, if there was enough interest in the community. A list was compiled of those Fremonters they felt might be interested in producing a play. Contracts were made and a first meeting was scheduled. The Staegers informed the group of their purchase of theatrical lights, for which they had to mortgage their car. It was decided the group would help raise money to produce the first play. Selling advertisements for the playbill was the primary method of obtaining finances, a practice FCT is still dependent upon today. With theatre lights, program advertisements, and a deep desire to perform live theatre, the group sought a place to practice and produce their first show. The Fremont Order of Moose, owners of the Old Masonic Temple, offered them a room on the fourth floor, the “Penthouse”. 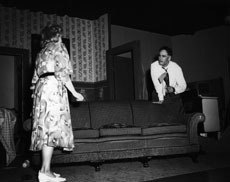 The group began calling themselves “The Fremont Penthouse Players” and chose “Harvey” for their first production, which was produced at the Moose building in a three quarter round before a total audience of 128 persons. The group considered their first show a success and immediately decided upon a second show. A week prior to this second production, Mayor Collins proclaimed the week of February 10-16, 1957 as Civic Theatre Week. During the fifth season, FCT in conjunction with the American Association of Women, put on the first children’s theatre. A monthly newsletter, the “Spotlight”, was established to keep the ever-expanding membership informed of theatre events. 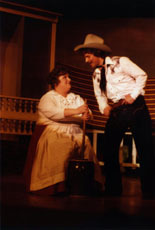 The plays presented that season included FCT’s first musical, “Carousel”. The musical was performed at the Fremont Junior High and was such a resounding success that FCT followed with one major musical in nearly all subsequent seasons. FCT joined the statewide theatre organization, the Ohio Community Theatre Association (OCTA), of which it has remained a member-in-good-standing to this day. The organization has participated in yearly “workshops” and theatrical competition through the regional and state meets of OCTA. During the sixth season, 1961-1962, the Fremont Community Theatre and Literary Society became incorporated as a non-profit organization, recorded with the Secretary of State of Ohio. Constitutional structure of FCT was changed to incorporate a board of directors, separate from its officers. By the time FCT finally found its home on Vanguard Place, the group had met in over twenty different places for rehearsals and performances over the fifteen years of its existance. This inconvenient nomadic condition prompted FCT’s members to take three years off from producing live theatre to construct the current theatre building, of which we are extremely proud. Fremont Teen Theatre was a natural outgrowth of FCT. Started in March 1969, this organization was formed by teens who had been active in FCT’s regular productions, and who were interested in having an outlet for their diverse talents. Over 30 years later Teen Theatre continues to form a vital part of Fremont Community Theatre. FCT . . . we’ve always been more than a stage in your life.